Lewis Hamilton can clinch his fifth Formula One world championship at Sunday's US Grand Prix. Hamilton started the season on pole position but Vettel took the 48th victory of his career, after a Mercedes miscalculation during a virtual safety car period that allowed the German to take the lead. Vettel's turn to start on pole in a Ferrari lockout, while Hamilton qualified fourth but started ninth due to a grid penalty for a gearbox change. The German made it two wins in a row, in his 200th start, while Hamilton finished third and behind team mate Valtteri Bottas. Vettel added another pole to his tally, with Ferrari again sweeping the front row. Hamilton qualified fourth. Daniel Ricciardo then seized a surprise win for Red Bull, with Vettel colliding with the Australian's team mate Max Verstappen. Hamilton finished fourth with Vettel eighth. Vettel completed a pole hat-trick, with Hamilton second on the grid. The Briton then took one of the luckiest wins of his career in a crash-strewn race that handed him the championship lead. Bottas suffered a puncture three laps from the end while leading. Vettel had made a lunge for the lead after the final safety car re-start but locked up and finished fourth. Hamilton took his first pole of the season in a Mercedes one-two, with Vettel qualifying third, and the reigning champion went on to win. 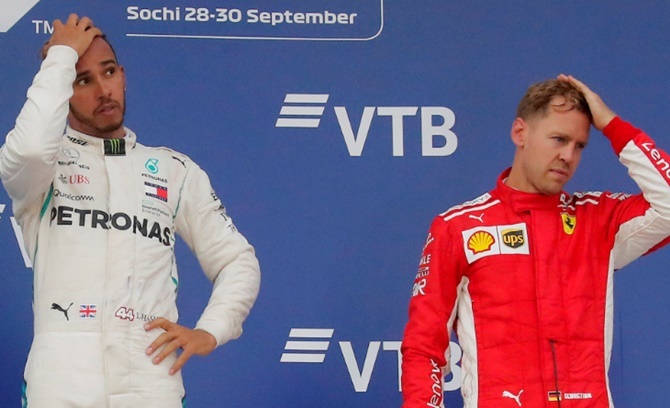 Bottas was second, Vettel fourth. It was a record 41st time that Hamilton had converted pole into victory. Ricciardo won from pole position, with Vettel second and Hamilton third in a largely processional race. Vettel took Ferrari's first pole in Canada since 2001, with Hamilton qualifying fourth. Sunday brought the German his 50th win and saw him retake the lead, with Hamilton fifth. The chequered flag was waved a lap early by model Winnie Harlow. Hamilton took his 75th career pole with team mate Bottas second and Vettel third. Vettel and Bottas then collided on the opening lap of the race, with the Ferrari driver handed a five-second penalty. Both dropped to the back of the field after pitstops. Hamilton won while Vettel climbed back to fifth. Bottas took pole for a change, with Hamilton second and Vettel demoted to sixth after a three place grid penalty for impeding Renault's Carlos Sainz. Hamilton retired from the race with eight laps to go, his first non-finish since 2016 ending a record run of 33 successive scoring finishes, with Red Bull's Max Verstappen the winner and Vettel third. Hamilton was on pole for his home race in track record time, with Vettel second. Race day reversed the positions, with the German winning and Hamilton runner-up after fighting back from the rear of the field following a first lap collision with Ferrari's Kimi Raikkonen. Vettel's turn to be on pole at home, with Hamilton qualifying 14th. Race day turned into a miracle for the Briton, who won in a Mercedes one-two while the Ferrari driver crashed into the barriers on a wet track while leading. Hamilton won from pole after a wet qualifying resulted in a Mercedes front row lockout. Vettel started fourth and finished second. The win was Hamilton's fifth of the season. Hamilton returned from the August break to take pole position in a wet qualifying. But Vettel won from second on the grid after a quick start. Hamilton had to settle for the runner-up position. The start of Hamilton's run of success, with the Briton winning after Kimi Raikkonen had put Ferrari on pole. The two title contenders tangled on the first lap, with Vettel spinning and having to fight back from 18th to fourth. Hamilton won after producing a stunning pole lap in qualifying, the Briton opening a 40-point lead over Vettel who was third. Bottas took another pole but it was Hamilton who won after the Finn was ordered to move aside in the race. Vettel was third and slipped 50 points behind. Hamilton won from pole, his fourth victory in a row and sixth in seven races. Vettel started eighth and finished sixth after a collision with Verstappen dropped him to 19th.